Background: Debris disks, what are they good for? Debris disks are rings of solid material surrounding stars. This material is leftover from earlier protoplanetary disks — more massive disks of gas and dust in which giant planets form. The particles comprising debris disks range from kilometer-size planetesimals to micron-size dust. Examples include the asteroid and Kuiper belts in the Solar System. Astronomers use debris disks to search for hidden planets around other stars and to study the process of planet formation and evolution. Some stars have debris disks that are gravitationally shaped by giant planets. The well-studied debris disk around the star Fomalhaut shows signatures of shaping as well, although there is controversy as to whether a planet has truly been discovered. If alien astronomers were to observe the Solar System, the first planet they detect might be Neptune via its gravitational influence on the Kuiper belt. 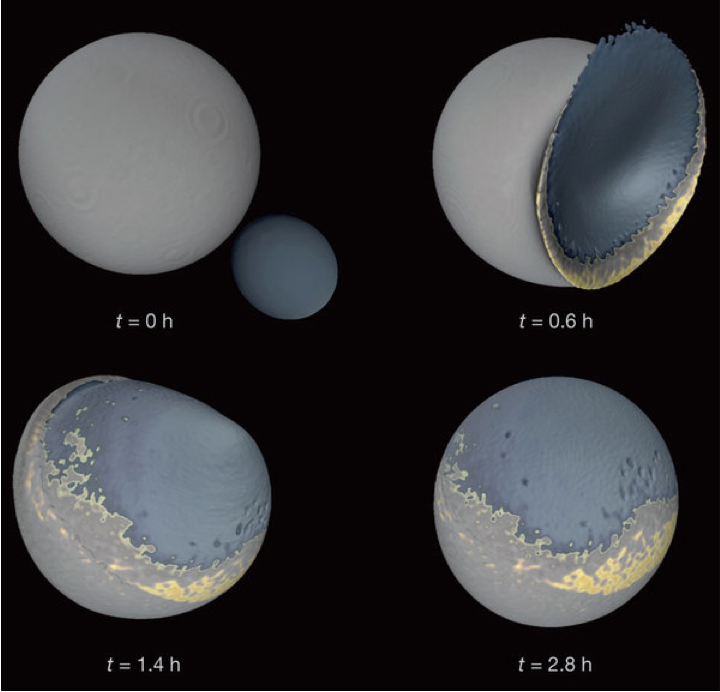 Also, simulations show that stars with debris disks are more likely to host terrestrial planets. In this paper, the authors measure the radial size (in other words, the orbital location) of cold debris disks. How planets form in the outer regions of stellar systems is not clear, but knowing the location of debris disks – the leftover material from planet formation – could provide some answers. 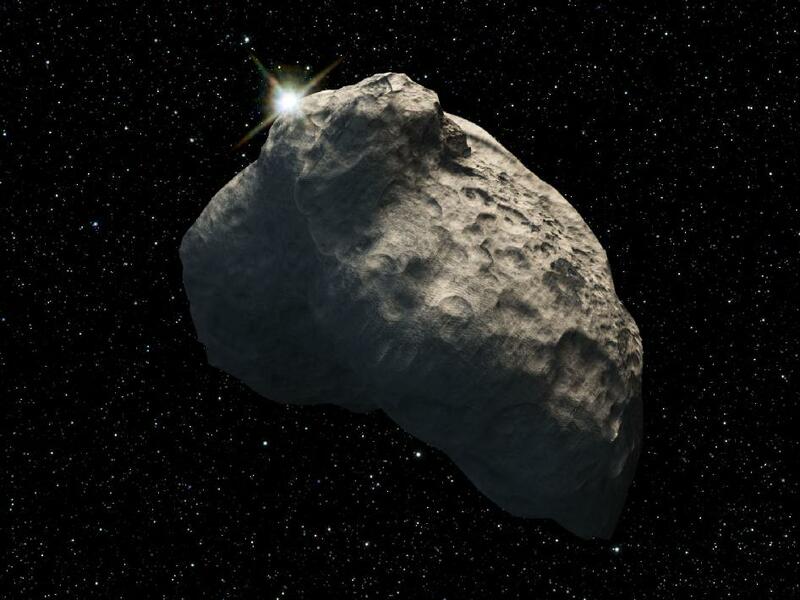 Furthermore, if a planet migrates outwards into a debris disk, the disk will be pushed outwards (Neptune is thought to have done this to the Kuiper belt). So the size of debris disks may also trace the history of planet migration. Figure 1. 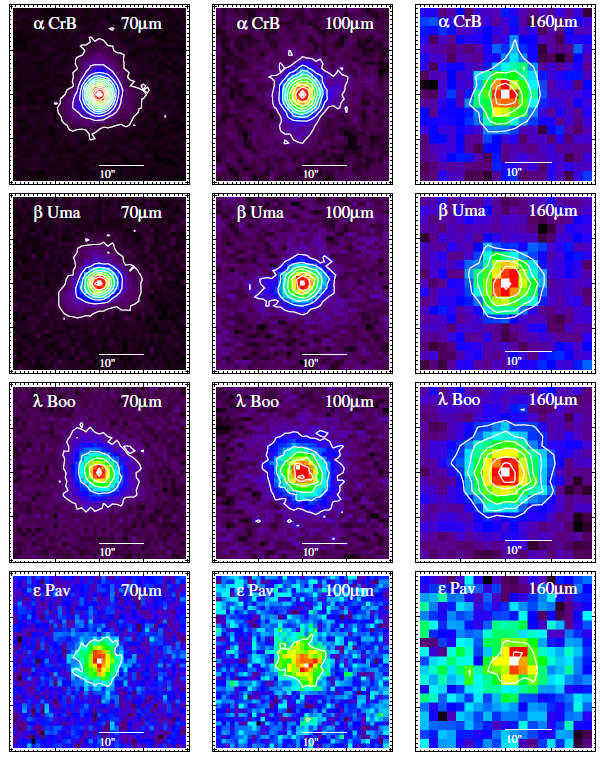 Resolved images of four of the nine debris disks presented in this paper. Each disk is imaged at 70, 100, and 160 microns with the PACS instrument onboard the Herschel Space Observatory. From Figure 1 of the paper. Observations of debris disks fall into two categories: spatially resolved or unresolved. Unresolved objects appear as a point of light to the observer, whereas the observer can determine the shape and size of a resolved object. Mathematically speaking, astronomical objects can be resolved if its angular size (how large it appears in the sky) is larger than the resolution limit of the telescope (Resolution = Wavelength of light / Diameter of the telescope). The authors of this paper use both resolved and unresolved observations and compare the results. The particles in a debris disk (primarily the dust) absorb a small fraction of the star’s light and reradiate that energy in the infrared or sub-mm wavelength regime. In unresolved observations, the star and debris disk are detected together as a single point source. But if the light is separated by wavelength into a spectral energy distribution (SED), the infrared radiation in excess of flux expected from the star itself reveals the presence of the debris disk. Hundreds of debris disks have been discovered using this technique. For unresolved debris disks, temperature is a proxy for disk size (smaller disks, which are closer to the star, are warmer; larger disks, which are farther from the star, are colder). The disk particles reach an equilibrium temperature at which the energy they absorb from stellar flux equals the energy they radiate (according to the Stefan–Boltzmann law, assuming they radiate as blackbodies). From the shape of the infrared excess SED (the Planck Function) the temperature of the disk can be measured and the disk size inferred. However, this inference relies on the assumption that grains emit as blackbodies. In truth, small grains radiate inefficiently at wavelengths much larger than their own size. They have difficulty cooling and attain a warmer temperature than perfect blackbodies; thus, they would be inferred to be closer to the star than they actually are. Spatially resolved observations avoid this problem by measuring the size of debris disks directly. However, resolving disks is inherently difficult as it requires large, nearby disks observed by large telescopes at short wavelengths (Remember: Resolution = Wavelength/Diameter). Only tens of debris disks have been resolved so far. The authors of this paper measure the difference between the true size of debris disks from resolved observations and the inferred size from the infrared excess SED. They do this for nine newly resolved debris disks around A stars with the Herschel Space Observatory as part of the “Disc Emission via a Bias-free Reconnaissance in the Infrared/Submillimetre” (DEBRIS) survey. Herschel is able to resolve these disks because they are relatively nearby (between 20 and 40 pc) and because Herschel features a large (3.5 m) primary mirror. 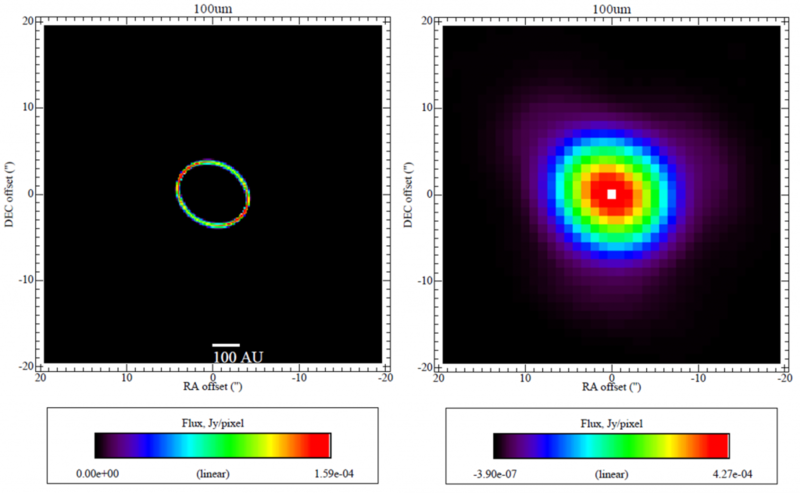 The disks are imaged with the Photodetecting Array Camera and Spectrometer (PACS) instrument at 70, 100, and 160 microns (see Figure 1). Figure 2. The best fit model to the epsilon Pav data at 100 microns. The left panel is the model disk emission only. The right panel is the model after adding the stellar flux and convolving with the PSF (this is compared with the data shown in Figure 1). From Figure 4 of the paper. To determine the sizes of these disks, the authors create a grid of models at each wavelength, varying the size, orientation, and brightness of the model disk. They then add the expected flux from the star to the center of the model disk and convolve the model with the point spread function of the PACS instrument to reproduce how it processes the image. (The point spread function describes how a point of light coming from an astronomical object is blurred in the final image.) The particular model from the grid that best matches the data gives the parameters of the disk (see Figure 2 for an example). To get the unresolved sizes of these disks, the authors fit SED models of stars and infrared excesses to photometry data from the optical through the sub-mm regimes. They use archival data from several different telescopes, along with their Herschel PACS data and additional data they gathered with the Herschel Spectral and Photometric Imaging Receiver (SPIRE) instrument at 250, 350, and 500 microns (the resolution of Herschel at these wavelengths cannot resolve the disks). Results and Conclusions: How big are debris disks, really? With disk sizes calculated for their nine targets using both the resolved and unresolved methods, the authors compare the results. They find that the ratio of the true disk size to the size inferred from unresolved observations ranges from 1 to 2.5. Next, the authors try to explain why this ratio varies among debris disks. Small grains (whose presence could explain the difference in disk sizes because they don’t act like perfect blackbodies) can be blown out of the system by radiation pressure from the star. Radiation pressure is proportional to flux, thus, it affects smaller debris disks around brighter stars more. The authors model this effect and find that it can explain the majority of the observed variation in the ratio of sizes. They cannot, however, explain the remainder of the variation, but they speculate that it could be due to differences in grain composition (which affects how efficiently small grains cool) or other factors besides radiation pressure that affect the population of small grains. These results provide a method to correct the sizes of debris disks inferred from unresolved observations. This allows for a more accurate determination of the true sizes of the hundreds of debris disks that are currently unresolved, making them more reliable probes of planetary systems.